Form is the most recognised part of Taiji. Elderly people waving their arms as they move in slow motion amongst the trees of a Chinese Park. Serious westerners in matching red pyjamas cavorting slowly before the TV News. Ask someone “Oh, you do Tai Chi?” and the next line will almost certainly be “What form do you do?” to which your response will most likely be, “I do such and such a form." In the modern world, overly influenced by creative design and advertising considerations, “Form" has come to largely characterise Taiji in general; to be seen as a kind of standard measurement, to eclipse and leave lost and unfamiliar the rather vast and important “rest” of Tai Chi. Perhaps we should ask where form comes from? China is obviously our starting point and as we are discussing Form I shall try to avoid falling into the contentious historical debating pit about what Tai Chi came first. Yang, Chen, Wu, Sun, Hao: let's call them the 5 major family styles of Tai Chi. Probably, as in there is a high probability that, somewhere between 1850 and 1930 Tai Chi evolved, was founded, developed, discovered, reorganised (you can choose) by someone and thus began to take on the plethora of shapes we recognise today. Did someone just make it up one day? Was it really written down on a bit of paper and bricked up in the back of a shop, so the builder could find it while fitting a new stove? Or was it really the secret treasure of just one family, one village. Did a young man come along, spy through the cracks in the wall when the family trained at night, become brilliant at it by practising all on his own, get taken in by the family and then found a dynasty? Or was Tai Chi invented a few hundred years earlier by a Taoist immortal, allegedly possessed of immense strength and wisdom, who could leap 20 feet into the air to catch birds passing overhead, his invention inspired by watching a Snake and a Crane fighting? All of the above and plenty more are widely and variously offered as stories of the origins of Tai Chi; not, however, of the origins of Form. Fascinating as it is, maybe we are asking the wrong questions. Perhaps we could make more sense of these complexities if we asked what Form is and maybe even why we do Form? That's the trouble: when it comes to writing about Tai Chi, since it is, to anglicise and paraphrase the words of my late teacher “an artistic endeavour on all levels, so great as to be without limits", it's kind of easy to be distracted from one's original purpose by the multitude of opportunities for discussion. So lets just say it:- Form is a vehicle designed for the practice of Tai Chi. Form, form is a piece of music, like a tune. I'll bet you know quite a few tunes. You can sing them, you can whistle them, you can beat the rhythm out on a table top. People recognise them (sometimes) because they have common, consistently crafted ingredients. The notes, the sounds, the individual pieces of vibration that fit together to create the entire song, conform to a basic set of rules which everyone recognises. This allows musicians to be able to play different songs but share the language of their creation. If everyone knew the tune, but they hadn’t invested time and effort in learning the nature of their instrument and how to play it, the tune would sound rubbish because it would be made of improperly crafted sounds, too sharp or flat, too long or short, high or low. And therein lies the whole issue: the techniques, knowledge and skills that have made Tai Chi legendary, the qualities that people aspire to and seek to gain through their practice, are hidden not entirely in the broad moving sweep of the Forms, but in the structural details of the Postures. The Postures are the Root from which all Form has evolved, the sounds that can be put together to make the tunes. 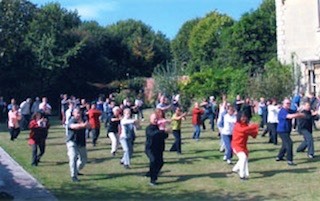 In exactly the same way as a muso has to practice blowing or stroking their instrument in just the right way so as to consistently and correctly reproduce a particular note (vibration), a Tai Chi student has to practice just the right posture with just the right physical and mental structure in order to consistently make "something" (Qi or vibration) move inside their body. With practice, this movement can quickly become strong enough to move them around (Spontaneous Movement) and with training maybe even towards the “next” posture. Millions of people practice Form, but so very few experience Taiji forces, mostly because they don’t know exactly how to do the Posture correctly, they don’t stay in the posture for long enough, their Training doesn't include appropriate instruction in how to direct the will and the mind and so they're thinking about where to go next instead of what's happening where they are now. We all learn and benefit from Form: Form has many virtues: it promotes calmness and even movement, helping us to “Meditate in Motion”, it gives a structure for regular exercise and practice, serves as a reservoir for the convenient carriage of a large block of Tai Chi knowledge, even satisfies the desire of the practitioner to be “seen” to be acheiving something: but it is not all there is to Tai Chi and I have no doubt that practising one posture really correctly and getting a meaningful result, one that causes a tangible spontaneous change in body and mind, is worth more than many Forms practised for years without proper content or meaning. After all, existence has never been orderly: combat even less so. If Tai Chi matters, shouldn’t we be able to choose to go anywhere, as dictated by our needs and in response to constantly changing external circumstances, rather than only being able to go to the south west because the Form says so?